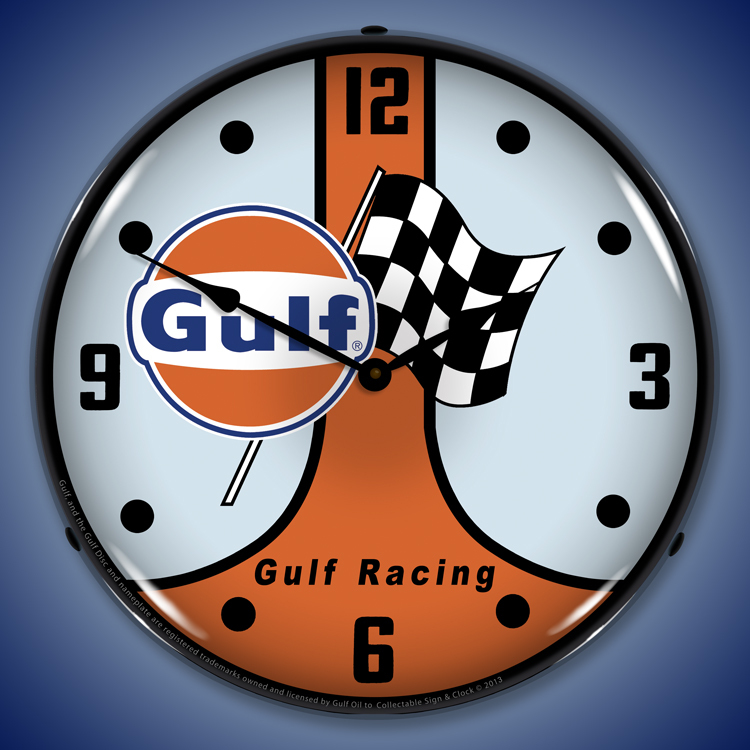 You want Gulf Oil clocks? We got �em! 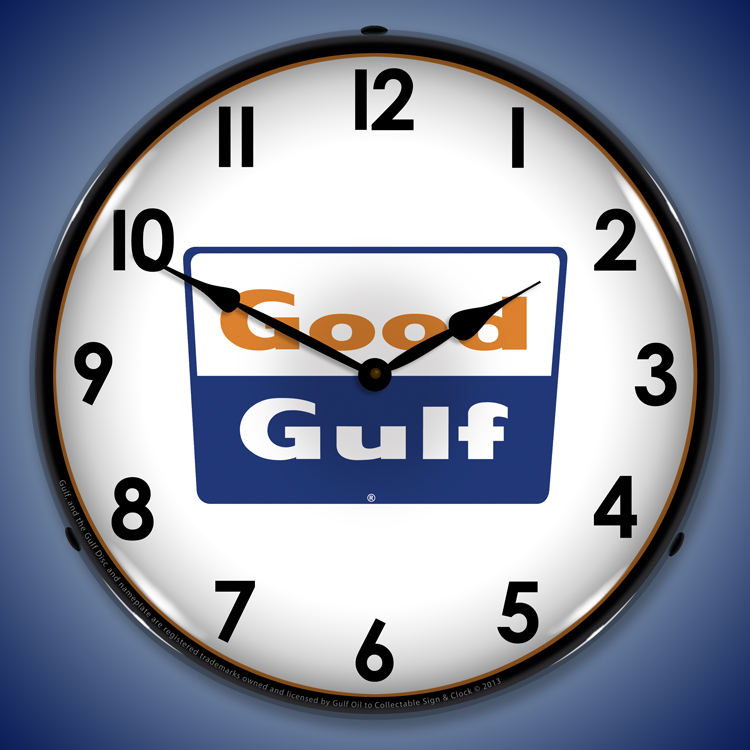 Gulf Oil was born in 1909 in Texas, the land of all things big. Cars were taking their place alongside carriages and the petroleum industry was becoming a necessity. 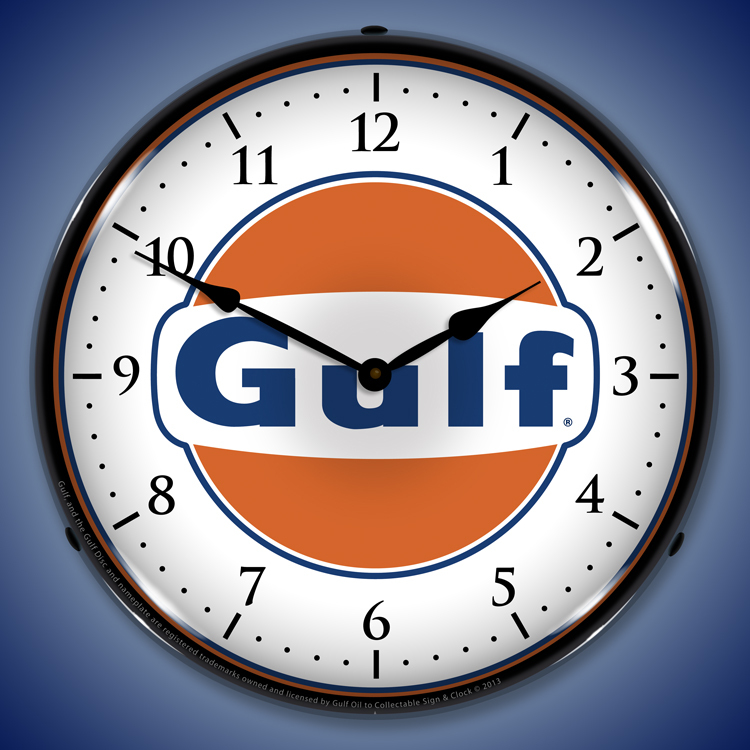 By the early 1930s, Gulf was a major U.S. corporation and a valuable component in the fast paced age of mechanization. 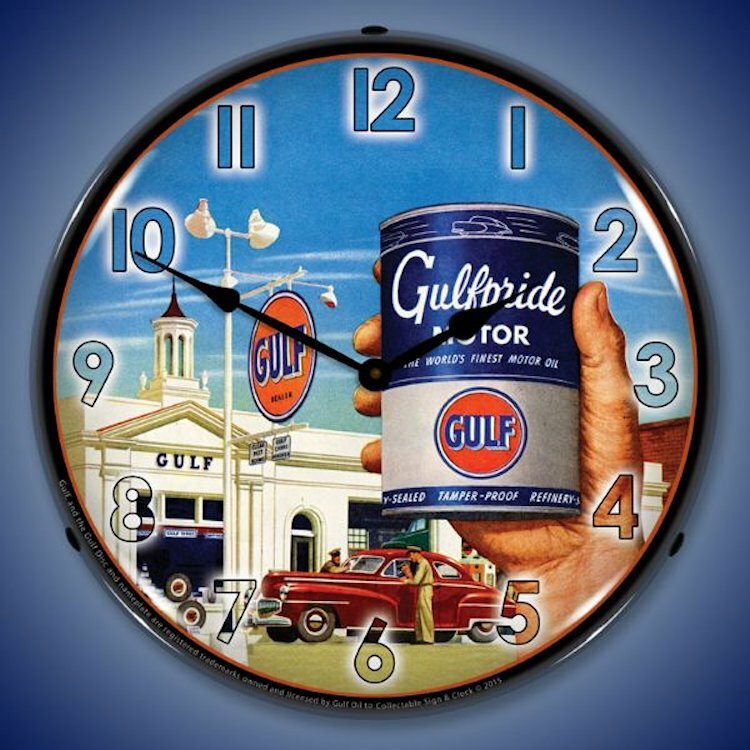 Gulf would eventually score with the first drive-in service station, water drilling and providing customers with complimentary road maps. 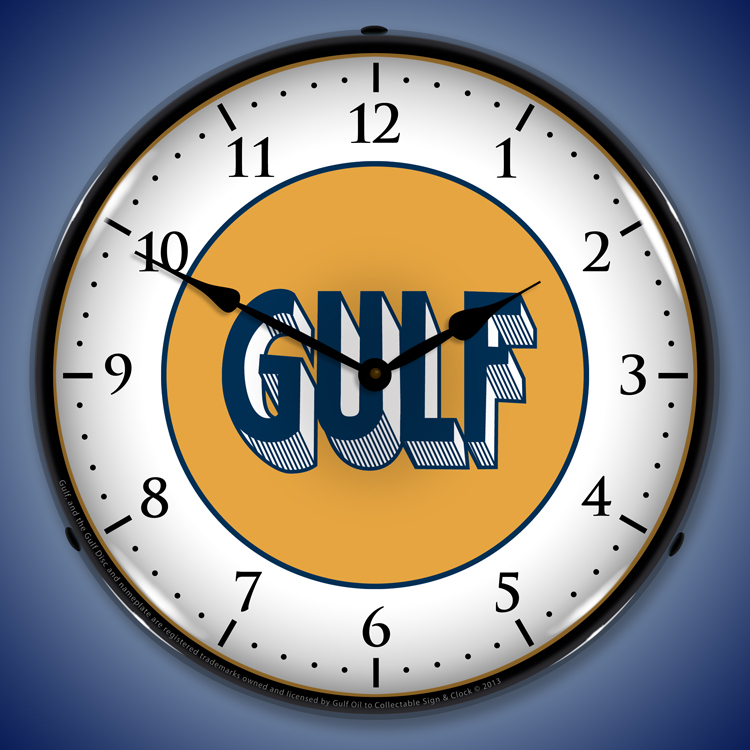 Gulf went on to establish exploration, production and marketing designs that continue to influence refineries, petrochemical and polyethylene production, and industry standards. 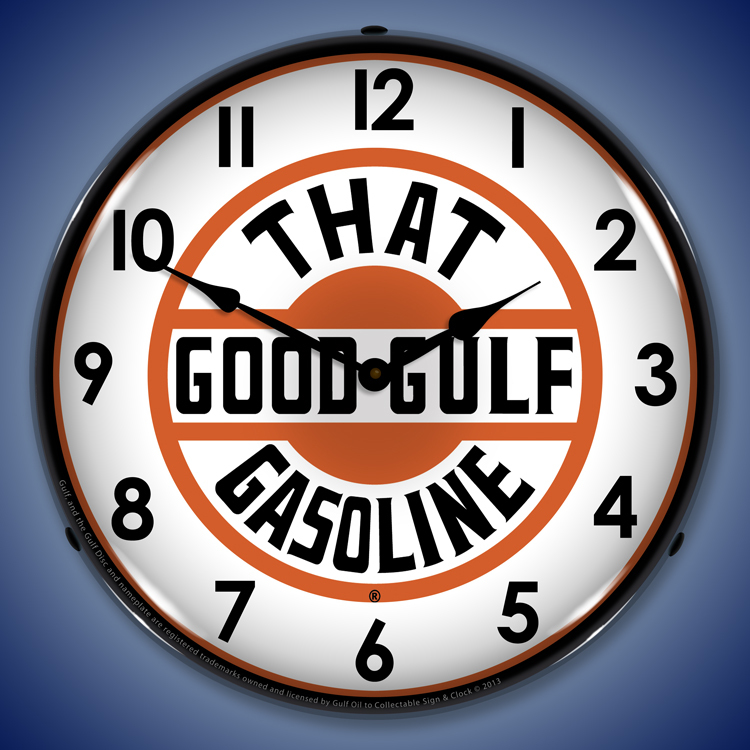 Headquartered today in Massachusetts, Gulf Oil Limited Partnership has over 2,000 service and gas stations, as well as a strong hand in the diesel fuel, heating oil and kerosene industries. 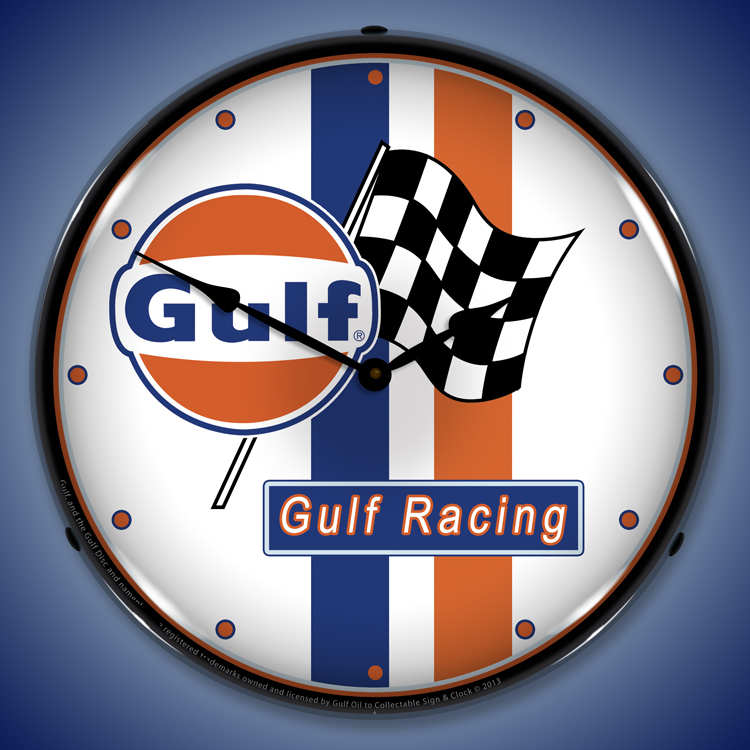 Their brand is more recognizable than the world�s most famous sports cars and NASCAR drivers. 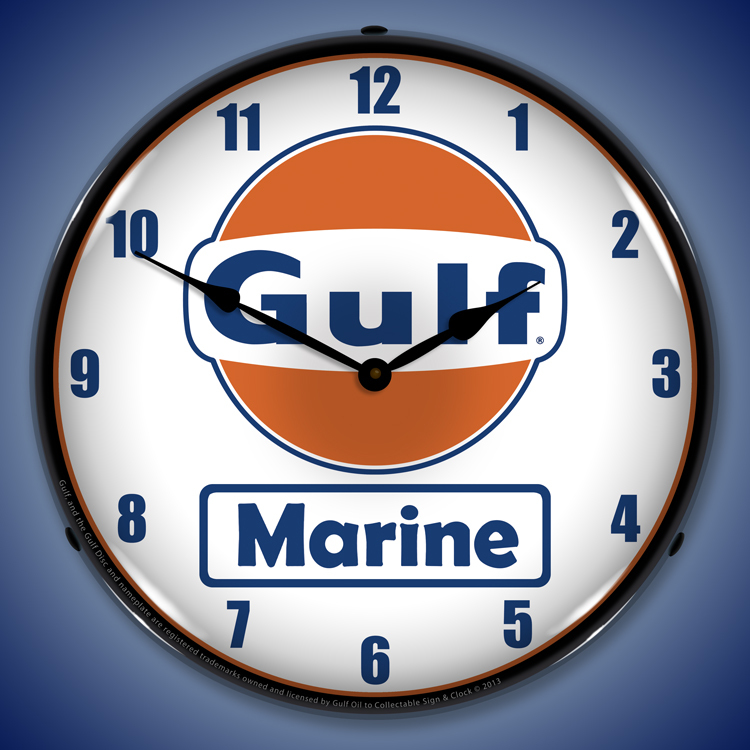 While most of the time pieces feature the current and most well-known company logo, there are models that highlight unique periods in the company�s past, including different colors and designs. 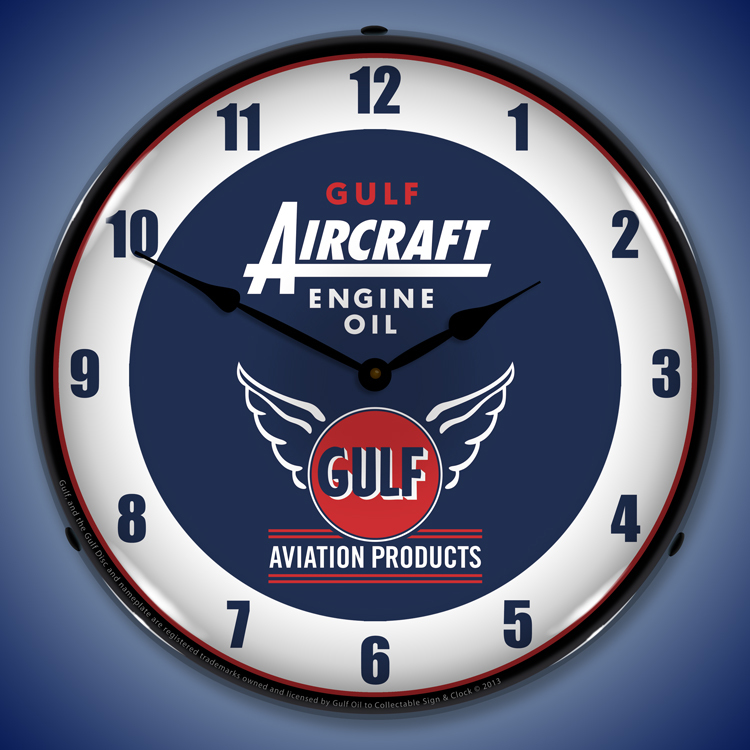 We have lighted clocks that promote the company�s contributions to the field of aircraft and professional racing. 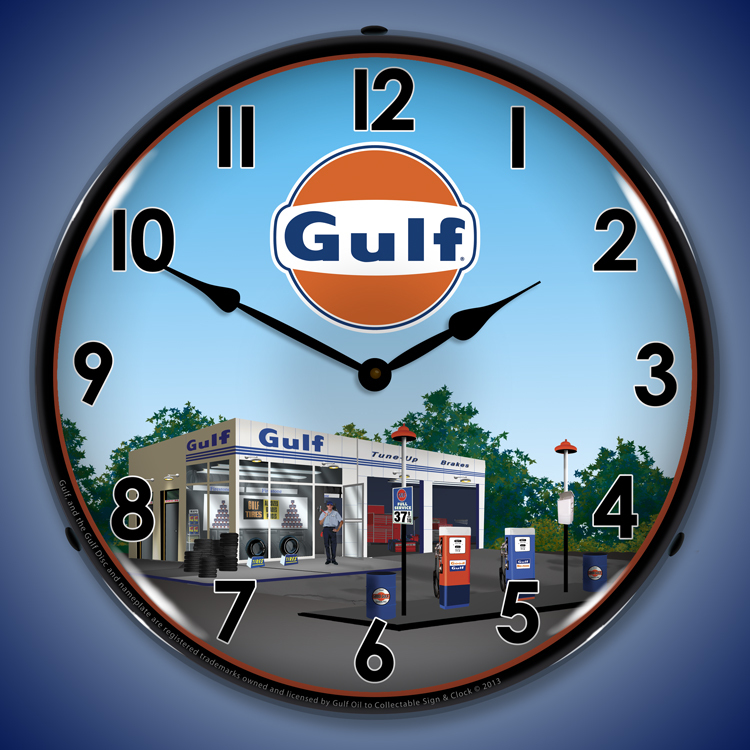 There�s also a clock that celebrates the Gulf gas station with a brilliant blue sky, trees and one of their unmistakable service facilities. 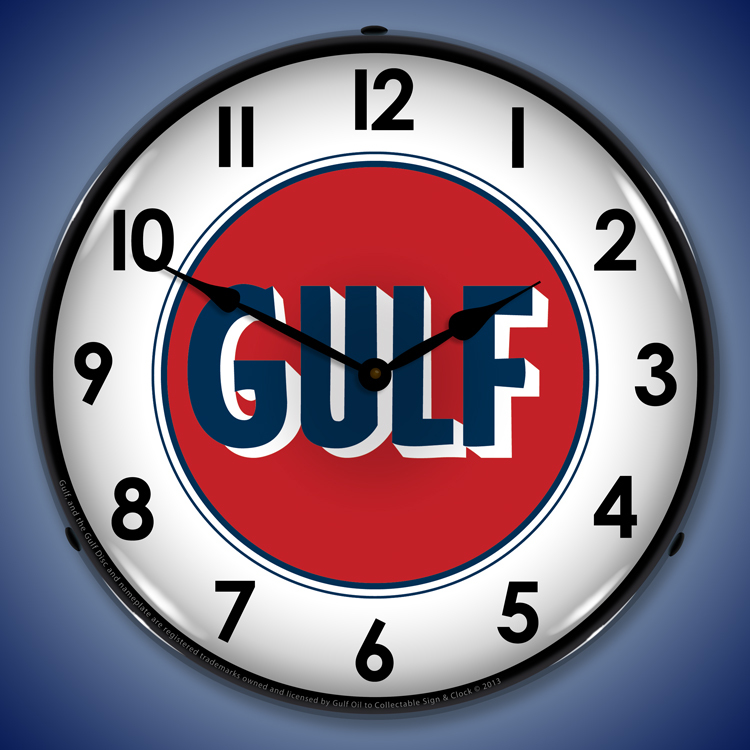 Our Gulf Oil clocks celebrates a century of history. Each lighted face is operated via electrical outlet and power switch. The Gulf Oil clocks have smooth quartz movement operation that�s run with a single double-A battery. 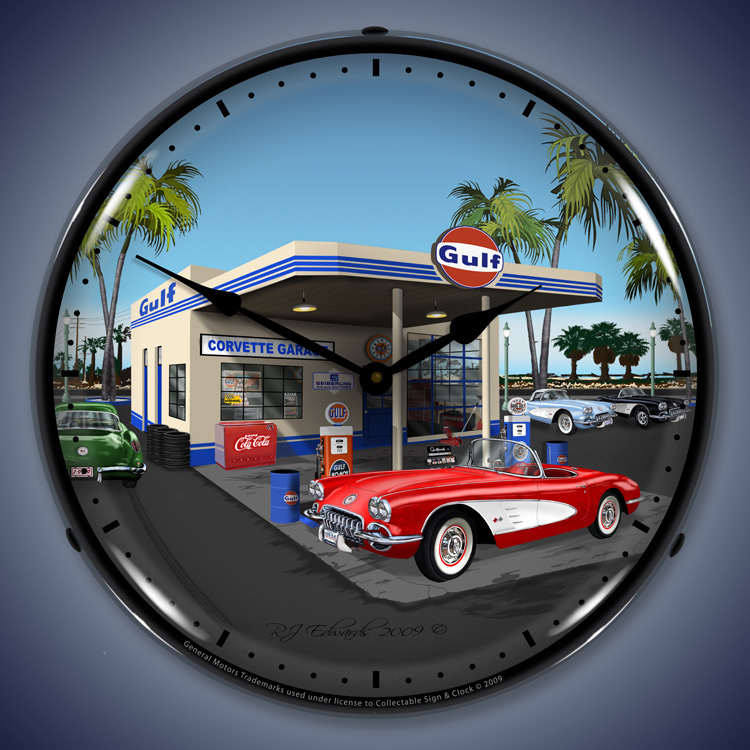 Measured at 14 inches across, the outer lens is scratch resistant and will stand the test of time, never yellowing. 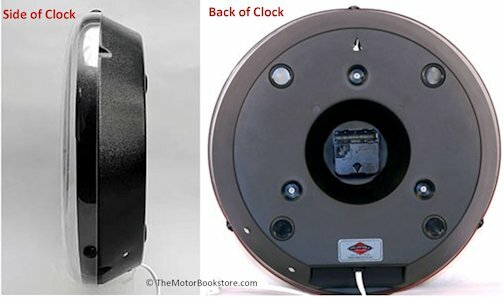 The clock body is engineered from sturdy ABS plastic that holds a 22 watt fluorescent circuline bulb that promises to last up to 11 years. 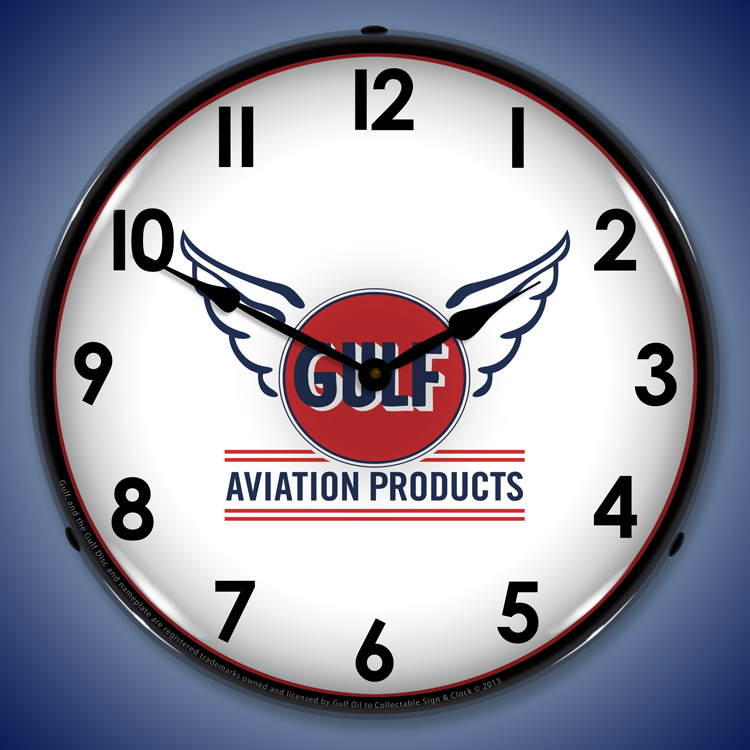 These unique clocks make great gifts or business giveaways.